The archdiocesan Office of Young Adult and College Campus Ministry brought 20 young adults on our annual pilgrimage to Washington, marching in support of the sanctity of all human life from conception to natural death. This year stands out in a unique way: although it’s always cold in D.C. this time of year, the extreme weather gave us a run for our money. 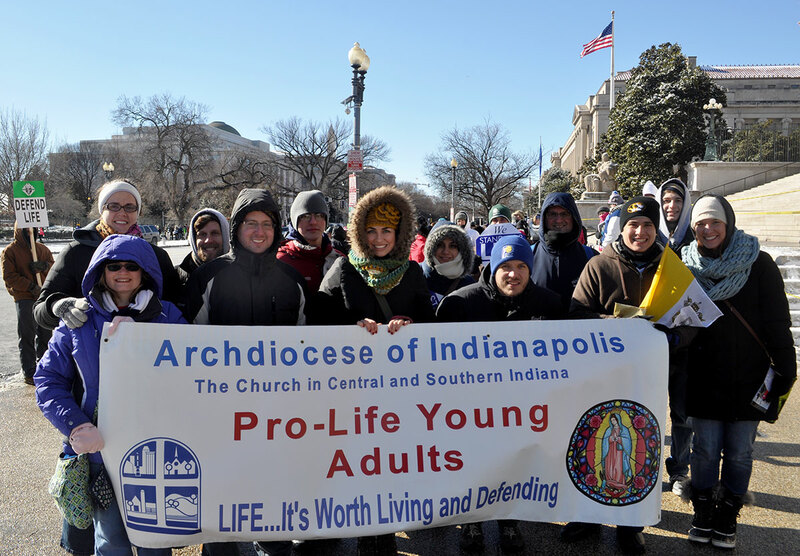 In the six years I have attended the March for Life, I have never experienced such cold conditions. Snow and bitterly cold temperatures flipped all our well-laid plans upside down. The federal government completely closed down; we could not go on our Capitol tour with Sen. Dan Coats; we were not able to visit the Holocaust Museum, which has always provided such a powerful experience for our group; and we couldn’t even walk down the street without any exposed skin burning from the frigid wind! It was difficult to concentrate on anything other than staying warm. I’ll be honest, it was a huge bummer. But God’s grace always trumps any inconvenience or trial that comes our way. Even though we were challenged by the elements outside, we were still able to celebrate the holy Mass each day—thanks be to God! It was good to just simply be in prayer and remember the reason we came to our nation’s capital in the first place. On Jan. 22, the day of the national March for Life, we were able to celebrate Mass in a side chapel at the Basilica of the National Shrine of the Immaculate Conception. It was clear that our sweet Lady was praying with us for all her hurting children. Uniting in prayer and receiving Jesus in the Eucharist gave us the strength to continue on and face the cold world all around us. And isn’t that what we are called to do as a pro-life people—to brave the cold world, a culture of death, to step out in love and faith for all those who have no voice? Yes! But we are not alone in this cause. We have the burning passion of our Lord, Jesus Christ, who continually pours his love into our hearts until they are set on fire! This fire, which can only come from God, is what keeps us warm in such a cold, harsh world. It gives us strength, perseverance and fortitude to continue living the Christian life to which we’ve all been called. And with our hearts aflame with love for God and his suffering little ones, the cold world we live in will begin to thaw, and the Gospel of Life and Love will conquer! In fact, it already has.